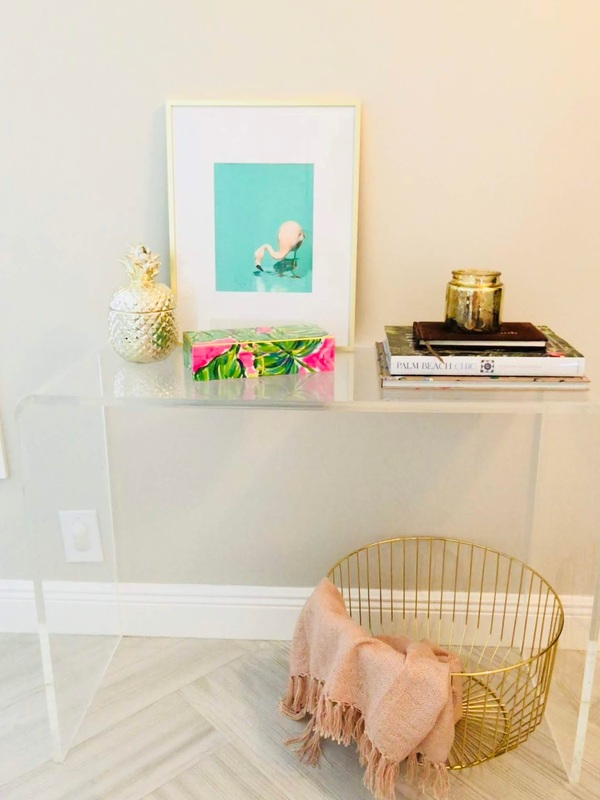 Printed and Framed photos provided c/o Minted. As you might know, we moved into this house 2 years ago and since then I have been improving, designing, and re-designing every little corner of this house to make it a home. I really enjoy doing it and love to love where I live. The layout of the entryway of our house is a little bit wonky. It was wonky to begin with and it improved slightly when we renovated the kitchen but still doesn't really make complete sense. On top of that, we do and always have had a lot of empty wall space that I've been slowly working on filling in. Recently I decided to move things around again and I'm really liking the result. We hung the gold and white shelves which filled in that empty space on the long wall but we still had an empty smaller wall just down from there. At one point I had made the mistake of hanging 3 smaller photos in a row on that wall but it didn’t fill in the space well at all so I eventually moved them and made them into a gallery wall elsewhere. So we patched up this wall, repainted it, and set out to find some artwork. I usually never temporarily fill in space or hang things that I'm not in love with, so besides that, I've been taking my time and just living with mostly empty walls for a while. I've ordered from Minted several times before. You can see one of my larger pieces here in this post. They have such beautiful pieces at great prices. I love just browsing their website and looking at all the art. It’s seriously the first place I look when I need art for my walls. 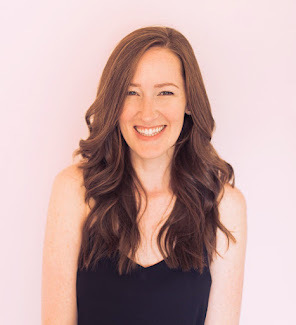 It’s easy to narrow down what you’re looking for and It’s not too overwhelming so I headed to their website to find something for that space. 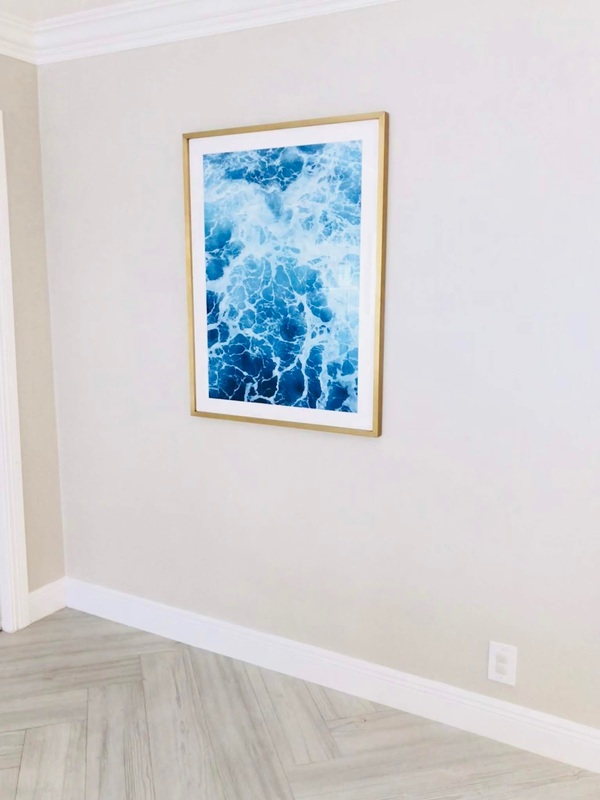 I saw this blue ocean water print on Minted and thought it would be the perfect thing. I wanted something sort of modern and kind of nondescript and I tend to prefer photography over paintings, which this was. 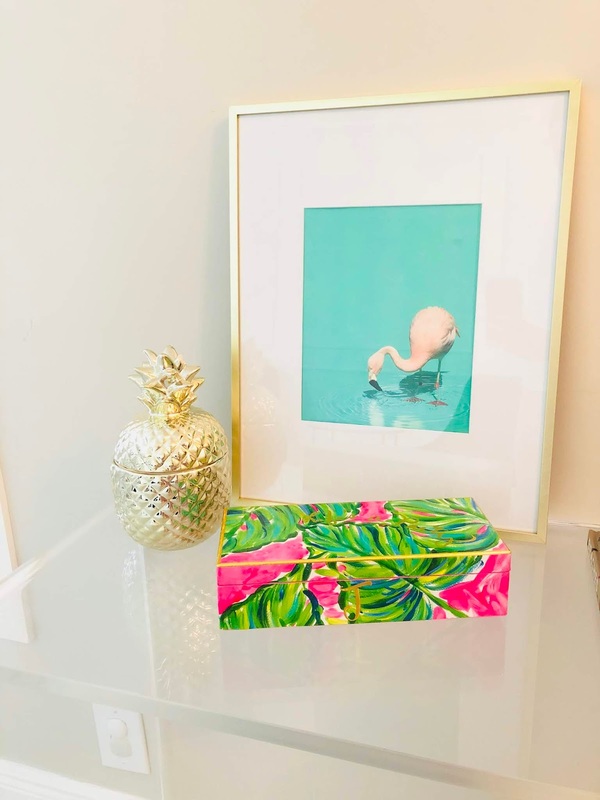 We don't really have a beachy theme to our house at all but I do like to add in a nod to the beach here and there, because it's beautiful and also very fitting, given that we live in South Florida, afterall. So this fit everything I wanted and I loved that it also has a bit of an ombre effect to it. I chose a large 30” x 40” to take up that wall. I did a white border with a matte brass frame. The gold color is very pretty in person. It’s a nice contrast to the shiny gold shelves and it gives the room some dimension. 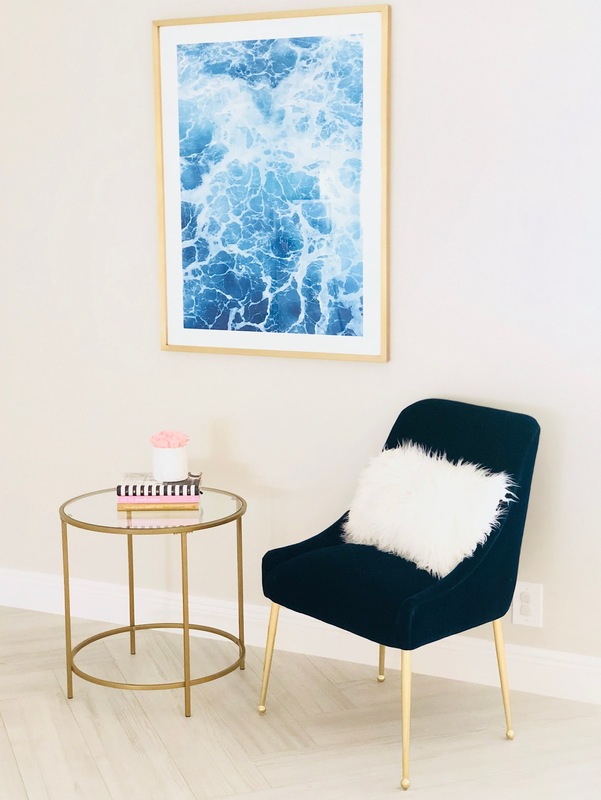 The piece looks amazing with our blue velvet chairs. I’m so happy with how it turned out, it’s the perfect piece for that space. This was the other piece I was debating over that I almost got instead. 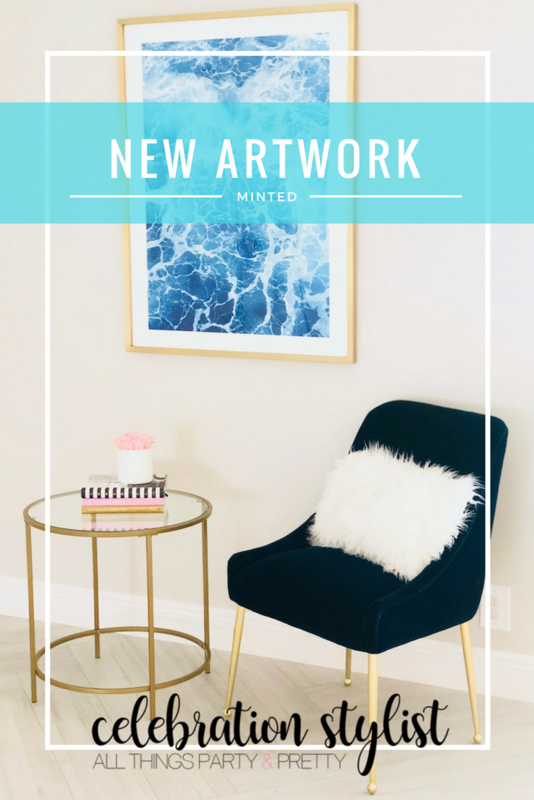 Its a print of a painting but I really like the colors of this artwork how modern and abstract it is but ultimately I think I made the right choice for this space. Then right before checking out, I stumbled upon this guy. I totally fell in love with it but definitely didn’t have a place in mind for it. I decided to just order an 8 x 10 unframed since I had no clue what I was going to do with it. The colors are a little unexpected for my house but when it got here I thought it would look cute on the entryway table and it did! I moved the entryway table to the wall opposite of where it was before and it was definitely missing something. I just put it in a frame we already had and it fit in perfectly in that little spot. The flamingo is just too cute! These prints are amazing!! they add so much to the rooms! I'm loving your wall art!! That bookshelf is also AMAZING and I'm OBSESSED with your floors. 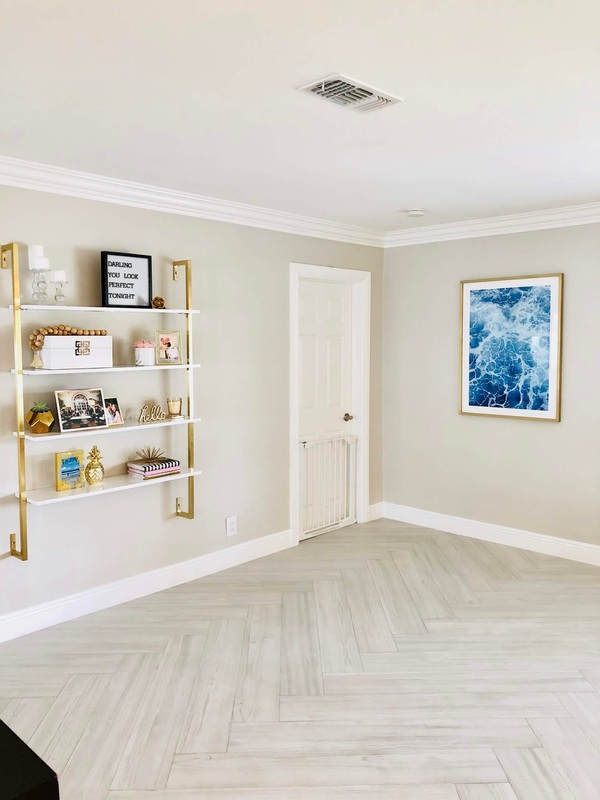 I have wanted herringbone wood floors for years. I hoping someday when we remodel our house, I can convince my husband to replace our hardwood floors. I am in love with these prints! So very pretty! !